Hey Lovies for todays post I wanted to get a little more personal rather than just giving the usual outfit spiel. I wanted to address the whole Media/Blogging world. Not too long ago someone who I had on social media wrote a comment like "today girls want to act like their models online". This comment resonated with me because in one way I can see why someone would say that since today people would argue we show/share too much online. But, the truth is, is it really for you to judge who people are based on some photos? As a personal Fashion & Style Blogger, I DO POST PICTURES THAT LOOK A LITTLE MORE PROFESSIONAL. That in no way means that I think I am a MODEL, or that "I am into myself", or that online I pretend to be someone I am not! My pictures do not FULLY reflect who I am, in fact they just show a part of me, the part of me that is a Personal FASHION & STYLE BLOGGER who is openly sharing a piece of myself through my creativity in styling. I think in todays world people are so quick to talk about you or make snap judgements about who you are based on a picture. I think we are all ALOT smarter than to believe we are just the photos we post. Now getting back to the actual outfit! Denim tops are Trending right now and what I liked the most about this particular top I got, is that it is off the shoulder. I think the top gives off sultry vibes so it really is the main piece of an outfit. 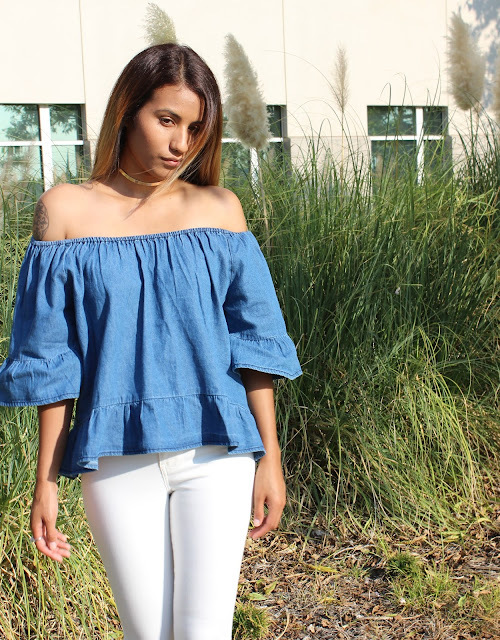 The beauty about a denim top is that It can be paired with literally any color (black,white,denim,olive) because its a multifaceted top. I decided to pair it with white denim and I can honestly say I love the combination. Because the top is already the center of attention I added subtle pieces of jewelry; a gold choker necklace and a ring. This is definitely an outfit that can be worn during the day or at night if you want to go out and get some cocktails! Ideal la blusa. Estas preciosa. Simplemente me encanta tu blusa, estas preciosisima! You look really lovely in this outfit. La blusa es muy bonita y con los vaqueros blancos combina muy bien.